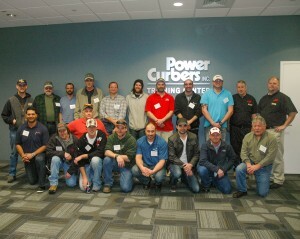 The training facility at the Power Curbers headquarters in Salisbury, NC, was a hub of activity for two weeks in February during the company’s annual Service School. Sixty owners, operators, and mechanics from 28 different companies attended classes for the 5700-B, 5700-Super-B, and the current model 5700-C.
Classroom sessions were taught by factory specialists on topics including machine operations, safety, maintenance, and troubleshooting. Students also participated in hands-on training for hydraulic maintenance and troubleshooting the electrical system. “I have been in this business 30 years. The class I took in Salisbury was the best class ever for me – right amount of class and hands-on work,” said Michael Trainor, paving superintendance for Barriere Construction in New Orleans. Attendees also had the opportunity to meet members of the Power Curbers team from product support, manufacturing, sales, and marketing, and were able to sit down with the engineering team to ask questions and share ideas about machine design. Tours of the manufacturing facility were also offered. Classes are offered during the winter season when customers are better able to take time away to attend. 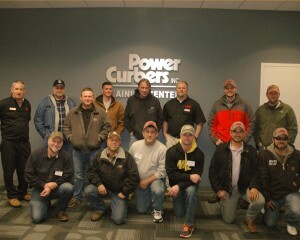 For more information on Service School, contact Power Curbers Product Support.